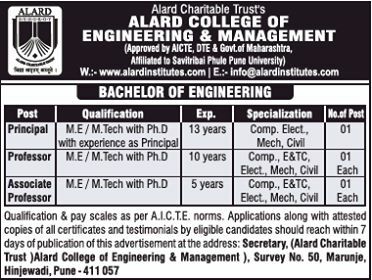 Alard College of Engineering and Management, Pune has advertised in The Times of India newspaper for the recruitment of Professor plus Associate Professor jobs vacancies. Interested and eligible job aspirants are requested to apply with in 7 days. Check out further more details below. About College: Alard Charitable Trust, an educational trust is registered under Bombay Charitable Trust Act 1960 bearing Registration No. E-2964-Pune dated 3rd Nov 1999.